June has been quite a month for us. 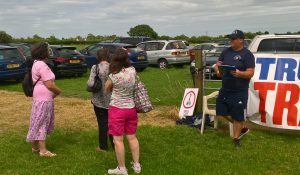 Opening the farm gates for visitors for the first time for Open Farm Sunday was quite an undertaking. We couldn’t have managed it without all our friends volunteering to help us out. Thank you so much to you all. Carolyn feeding strawberries and cream to the masses! Carolyn, Sarah, Michael and Asher for being amazing caterers, the scones were brilliant. 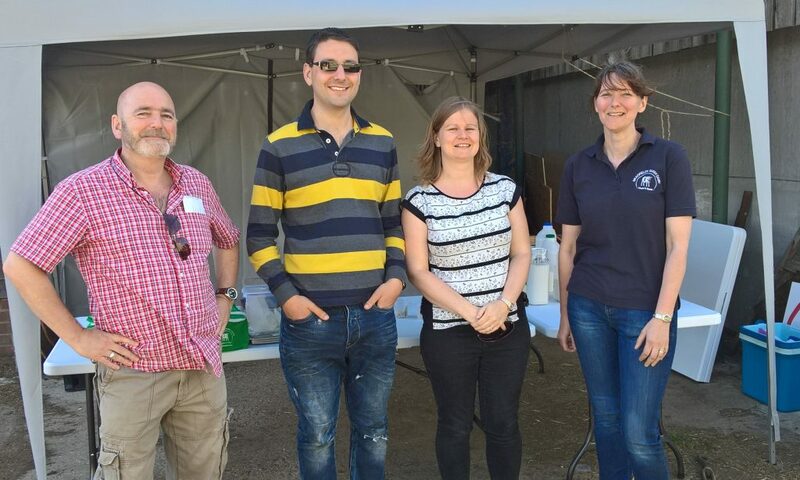 Tony, Fi, Scott and Emma for manning the cheese tasting and shop, you did a wonderful job. Chelsea and James for looking after the calves. Joy, Julie and Pauline for organising the fantastic calf colouring and Lynette, Lauren and Nicky for being our excellent tour guides. 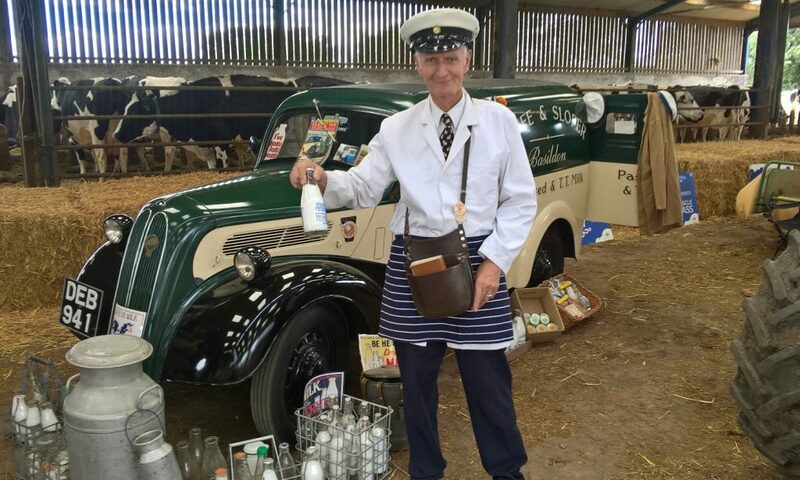 Also Peter Sloper for joining us with his lovely vintage milk van, John and Robert Lyon for the loan of your tractor and portaloo, Alex Sell for bringing the forage harvester and helping out on the day. 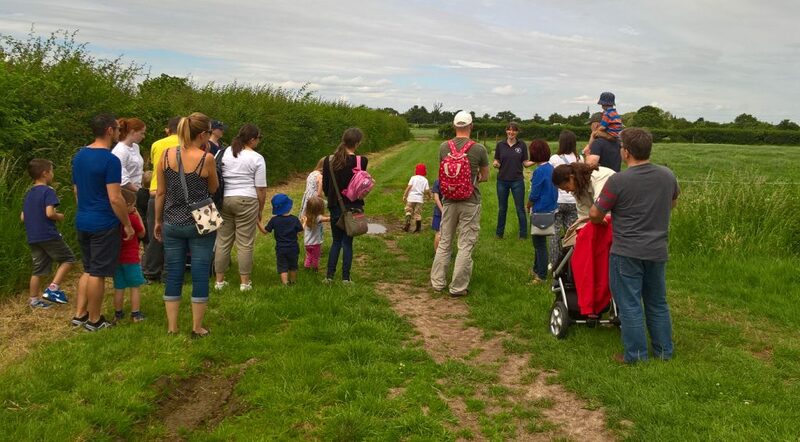 And a big thank you to everyone who came along to see the farm too. 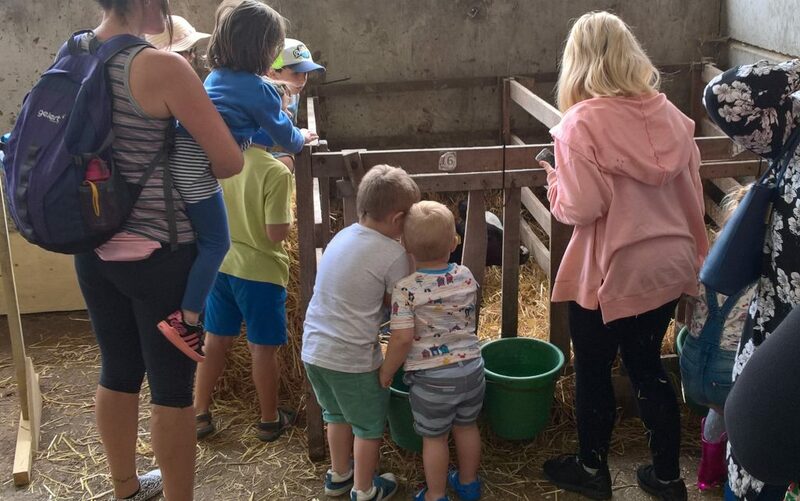 We hope you had a good time and enjoyed meeting the cows and calves and finding out what happens on the farm. 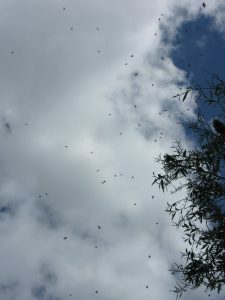 People weren’t the only things swarming over the farm this month, our resident wild bees decided to join in the fun and swarmed. First they decided our white van was the place to be before finding a better spot in the willow tree while they scouted for a new home. 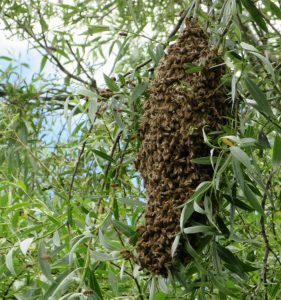 With so many stories about bees dying out it is lovely to see ours en mass and hopefully making a second colony somewhere nearby. 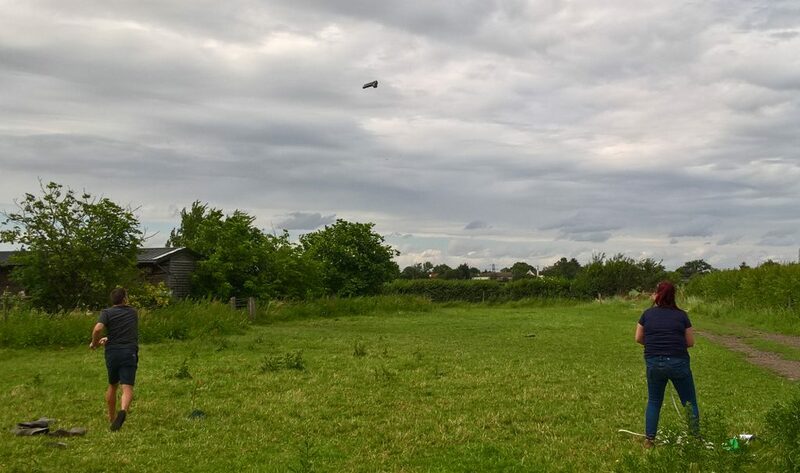 And the bees weren’t the only wildlife on the farm either as we were joined this week by a rather lovely goose who stayed this week and set off again last night. 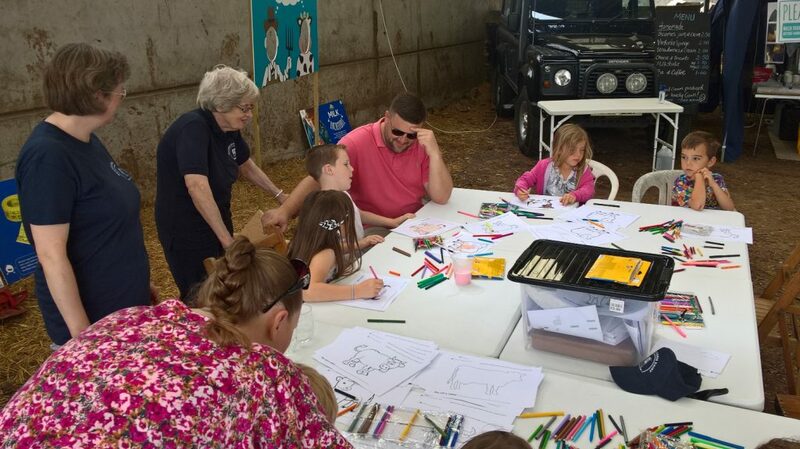 Open Farm Sunday Competition Winners! 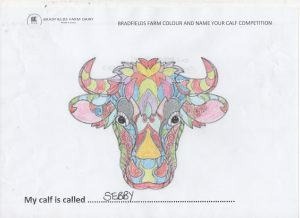 Here are all the competition winners from Open farm Sunday “Colour and Name the Calf” and the “Wellie Throwing”. 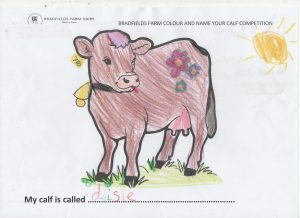 We have chosen eight drawings and names for the eight heifer calves that are now in the barn. 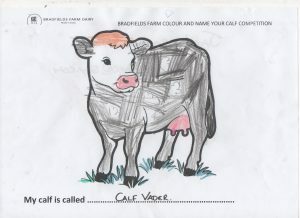 …and finally, the magnificently named CALF VADER! by Jax Lambourne. The Force is with this one! Thank you to everyone who did a drawing. 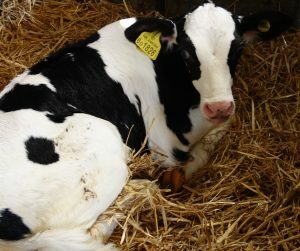 We will use some of the other names as more calves are born through the summer and keep you posted. 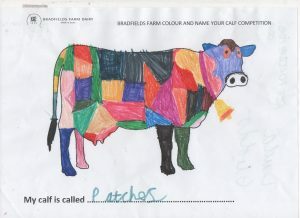 If anyone wants to keep their drawing, they can collect it from the Farm. We will be in touch with all of the winners next week. 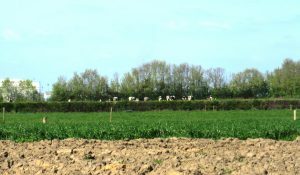 Spring is here and the cows are back out in the fields. It is always my favourite day of the year when the cows go out, seeing their joy in being back on the grass. This morning my Dad Nick said to John “Isn’t it beautiful?”. John inquired as to whether he meant the weather. He just gesticulated with his arms – everything. 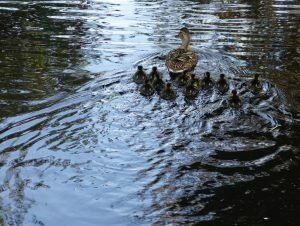 Indeed, there are new ducklings on the pond, clear Spring days, the grass verdant and the trees bursting out. There’s been a lot happening too. 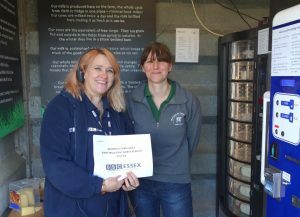 The BBC Essex Radio Quest team came to the Farm last Sunday (2nd April). 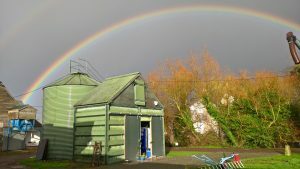 The Farm was the location for the start of the programme at 9am. It was great to be part of the show and we talked about what we are doing at the Farm before the Team tried our products. 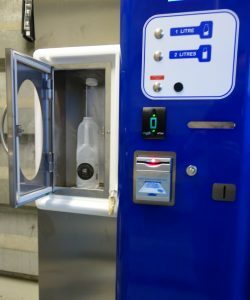 Not everything went smoothly though – we had the cunning idea of videoing them filling a bottle of milk for their Facebook site, only to have the vending machine not stop and shower Liana with milk! I know Cleopatra liked to bathe in milk but it wasn’t quite what we intended and certainly not the promotion we had thought it would be. After a stressful panic, recalibration and the standard IT fix of turn it off and turn it on again we gave it another go, only for the same result. Just before going live to air. As soon as they left we went to look at the machine and opened it up to realise that we had forgotten to plug in the meter that measures the milk. And as anyone will tell you, if you don’t plug it in you can’t expect it to work properly! Anyway, we compensated their milky hand with cheese and cream scones so no harm done and the machine is all working again. Things have moved on quickly recently. We are now getting into the swing of pasteurising the milk every other evening. That way we get the milk into our vending machine the evening that the cows have been freshly milked. We are also bottling the milk and potting up cream after every pasteurising, ready for deliveries to shops the next morning. We are now supplying four shops. 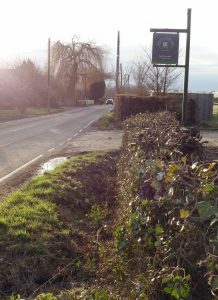 We started with Purleigh Stores in the middle of March and then Jon Gold Farm Shop at Lubards Farm near Hullbridge. 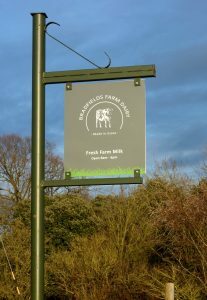 We are now also supplying Burstead Farm Shop at Little Burstead, south of Billericay and Stockbrook Farm Shop on the north side of Billericay near Stock. This is a new phase for us and is keeping us very busy. 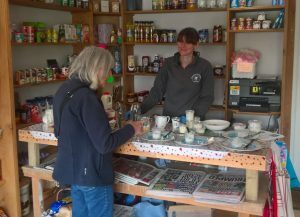 We have been doing tastings each weekend at the Farm, but did our first one elsewhere yesterday as part of a cheese and wine tasting at the Purleigh Stores. We had lots of interest and are setting up a pre-order service so that people can order what they want and pick up at the store. We will be doing a tasting at the Burstead Farm Shop this Saturday. Well it has been a fascinating first full week of opening our shop. 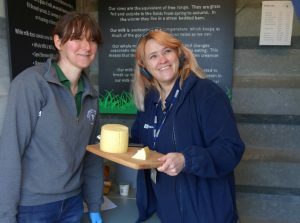 It was wonderful to be able to get feedback from everyone who has visited over the last two weekends when we have had cheese samples available for everyone to try. A huge thank you to all the customers who have been in, it has been lovely talking to you all. 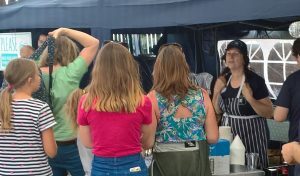 It been a busy week too, we had some extra advice from our cheese microbiologist a fortnight ago so we have been trying out those ideas on the cheese making too. Leaving the soft cheese to mature a little longer before salting to increase the intensity and adjusting the pepperiness of the Chalvedon hard cheese. Do you think it will go in? But the big project for the week was vending machine number two. It arrived on Monday a week later than we had hoped. Whilst it did fit in the space we had made for it, it blocked the power sockets so we have had to have those moved before we could get it in the shop, creating yet another job for my Dad, Nick, to do. After it bending the pallet it had been sitting on we called for reinforcements to help us move it. 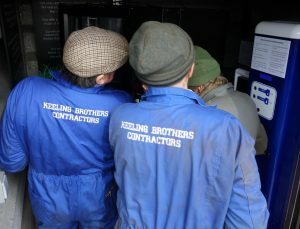 Billy and Dennis Keeling came to the rescue and gave us a hand. We fork lifted it as close to the shop as we could and carried it through from there. Which we couldn’t have managed without their help. Finally in situ we came to the task of interpreting two massive books of instructions to fathom out its operation. John persevered with the daunting task and is now master of the vending machines, except its little quirk of hating 10p’s and refusing to give them in change. 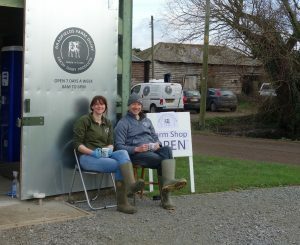 So it has been in use over the weekend for cheese, cream, skimmed and semi-skimmed milk making it much easier to set up the shop and samples this time giving us time for a quick break first thing before we got started. On the farm it has been a very stressful fortnight. My Dad and Sister were summoned to a meeting with Muller, who currently take the bulk of our milk. The meeting was to give us and about 18 other farmers notice on our contracts as they are cutting all milk collections from East Anglia. 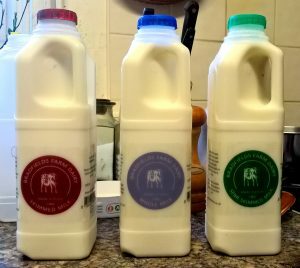 We were half expecting the news as they announced the closure of Chadwell Heath Dairy a few months ago and that is where our milk they collect goes. 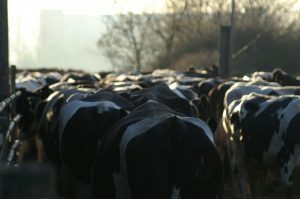 The rest of the Chadwell milk will be going to the west country for processing. 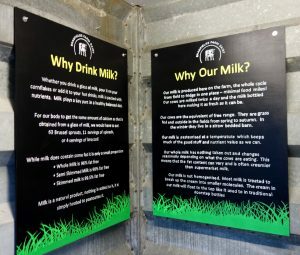 Fortunately Arla are looking for a small number of milk suppliers at the moment and have given a once only offer to farms affected, a bit of a turnaround as they gave notice to one of our neighbours only a year ago. 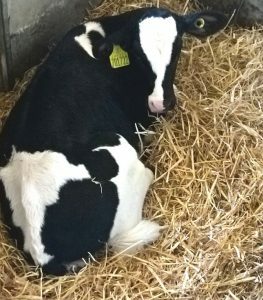 A couple of the other farms have told us enough is enough and they are going to give up so we could be down to 5 dairy farms in Essex before long. So a worrying time, without a new contract we would have to have given up too, our new milk shop helps the situation but not enough yet to have survived without a main dairy collecting. But we have gone with the Arla offer so that should give us some stability for now. 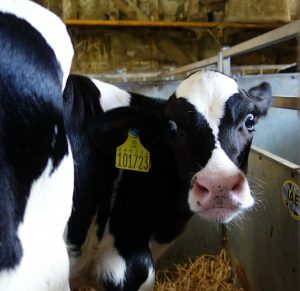 We also think with the closure of Chadwell heath that we will be not just the only on farm cheese dairy in Essex but the only milk processing dairy in Essex too. A few more bits to do next week, we will be updating the website with information about all the products and hopefully getting our banners up on the granary and roadside if it is not too windy now storm Doris and Eric have both passed us by. Thank you for all the positive Facebook reviews and comment and we hope to see some of you again soon and some new customers too. Well we had a little mini opening this weekend and sold our first milk. 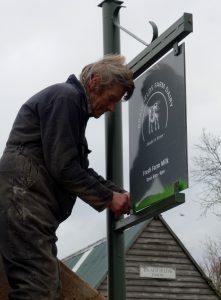 We thought we would try things out quietly so my Dad and John put up our subtle dairy signs on Sunday morning along with the lovely new blackboards which John made for the shop. We pasteurised some milk on Saturday evening and put a small amount in the vending machine for Sunday morning. A few people saw the signs and came in to see us which was just perfect to test it all out. It is only the whole milk that is for sale until the other vending machine arrives but we salted a new batch of soft cheese to be ready for that yesterday and made basil soft cheese and mint soft cheese which are ready now too. Will be running the next batch of milk through the pasteuriser on Monday evening ready for sale on Tuesday morning. 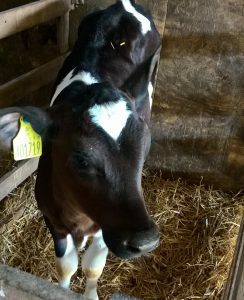 We will be pasteurising in the evening every other day from now on, using the milk from that morning and afternoons milkings so it is as fresh as it can be when we process it. The tanker from the dairy that takes the rest of the milk comes every other day so our milk will be on sale nearly a day before the rest of it leaves us for processing. We are really pleased with how the vending machine is working so far, and hopefully the cheese and cream vending machine will be here soon too. Work on the farm is a bit grim in the cold and wet of February but its all been happening this week. We unloaded our supply of plastic milk bottles on Friday afternoon along with cream and cheese pots. Our milk bottle labels arrived on Monday, along with the new cheese maturing trays. The whole and skim milk have passed all their tests and the shelf life testing is back on the cheese and cream so we can set the use by dates for them all. Just the testing on the semi-skimmed milk left to complete and those sample are going off on Wednesday. The cream we have been making is a lovely extra thick type and we are experimenting with a double cream too which will be tested this week too. 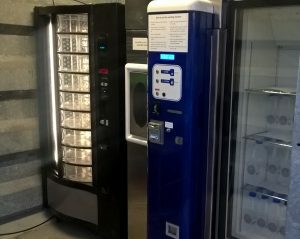 Had a bit of a disaster when one of our milk pumps died on us which has delayed us slightly but now have a spare arrived and a back up on order so that will be re-installed this week hopefully, so we can use it to fill the vending machine. A vending machine for the cheese and cream is due to arrive next week, the final bit of equipment we need to get the self serve shop open. We went to see Charlie in Hertfordshire on Wednesday. He has a vending machine for raw Jersey milk which is very popular. He has told us how things were going for them and what we need to think about. His biggest problem is the glass door to the filling area being closed while the milk bottles are being filled. The machine is designed to steam clean after it is used so if you shut the door while it is filling you get a bottle full of hot water instead of delicious milk! So we are days rather than weeks from opening. Making a new batch of soft cheese, Bure’s Essex Soft Cheese, on Wednesday which we hope will be the first batch that will available for sale the following week. By which time we hope it will feel a little more like spring won’t be too far away. 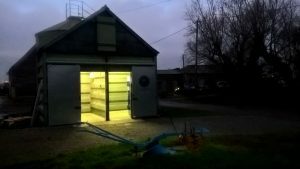 Winter is here with a blast of chilly air and giving the farm even more work to an already hectic schedule. Cows drink between more than 10 gallons of water a day (lots more in summer) so keeping all the water tanks full is absolutely vital for their well being. 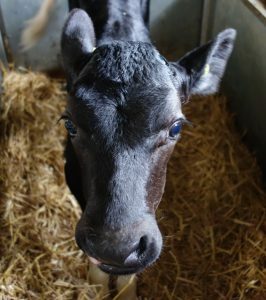 With the temperature showing minus 8c when my sister got up to milk it was unsurprising that most of mornings for the last week have involved defrosting pipes and tanks and carting water to the cows, calves and stables until all the pipes where back running. We had quiet Christmas but a bit of a stressful New Year with fireworks upsetting the younger cows. Our girls are quite chilled and we haven’t had any problems for some years, but we always keep a close eye on them at New Year and 5th November just in case. 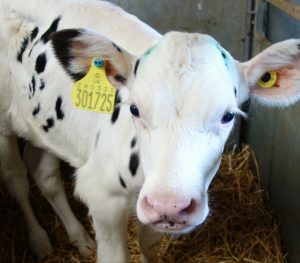 They can be spooked by loud bangs if a firework goes off near the cow sheds. Like all herd animals if one runs they all do. This year unfortunately was one of those times and one of our two year old heifers slipped and injured herself. We thought she might have broken her leg on first look but thankfully she was just a bit bruised and bashed. She is back completely fit and healthy again now which is a great relief. 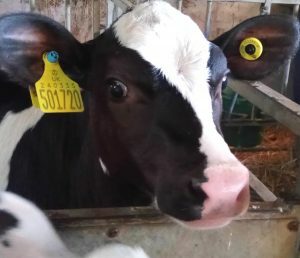 In the dairy, we have done our final milk run test and hope to have the whole milk in the vending machine after we get that test result in about 10 days. We have got the cream consistency to the extra thickness we wanted and that is now being tested too. On the cheese side we have been taste testing how the soft cheese works with a variety of herbs. We are just waiting for shelf life testing on the cheese and then we will have it available for sale. 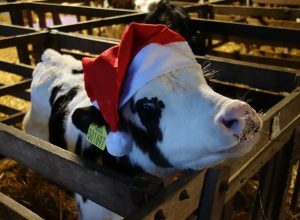 It’s the night before Christmas and the calves are fed and tucked up for the night, cows milked and having their evening meal, a quiet end to a hectic week. All good things come to those that wait, and the dairy got conditional approval for food safety on Monday, quite a milestone for us. Still a couple of weeks of testing to complete in the new year before everything is ready but a fantastic step towards opening. 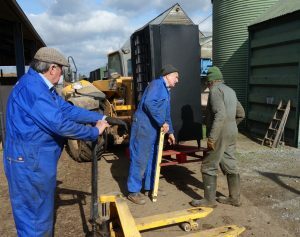 On Tuesday the vending machine arrived and was installed by George from Fen Farm Dairy. So that is now ready to go once the testing is complete. Wednesday and Thursday we were experimenting with the cream separator to get the different thicknesses on the cream to see what is best. So lots to be jolly about this season. On the farm Christmas day is work as normal the girls need to enjoy their Christmas too. An early start for the milking but we do try and get done on time so we can have a proper family Christmas dinner in the evening. It’s the only day of the year when the hot cooked dinner is in the evening rather than lunchtime. So a Very Happy Christmas to you all and best wishes for 2017. 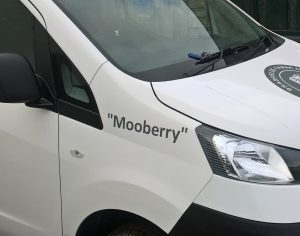 We now have our new refrigerated van and have called her (we think that she is a girl) ‘Mooberry’ after one of the calves named in our recent “name the calf” competition. We think that Mooberry looks great in her new signage with the cow logo. 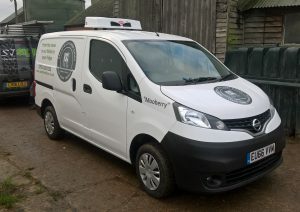 Mooberry will be delivering milk, cream and cheese to local shops in the new year, so watch out for her. It has been quite a couple of weeks. Still so much going on at the Farm. The milk pasteuriser has arrived at last and was fitted up a week ago. 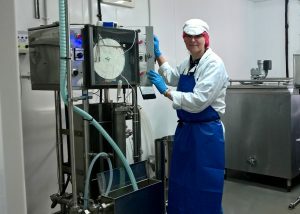 We ran it last Saturday and made our very first pasteurised milk and used the milk to start making a soft lactic cheese. Yesterday, we started our first make of the ‘Chalvedon’ alpine style cheese using the pasteurised milk. 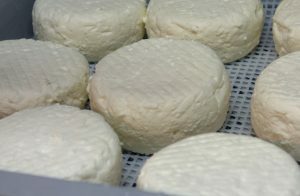 Everything seems to be going well with the new cheeses so far, but we will of course need to see how they mature and develop. The cream separator is being fitted today and we will be making our first cream tomorrow. We also start testing and there is plenty of that to do before we can sell our products, but we feel that we are on the homeward stretch with bottles, labels, pots and lids are all on the way. We are working hard to try have milk and cream ready for sale by Christmas. 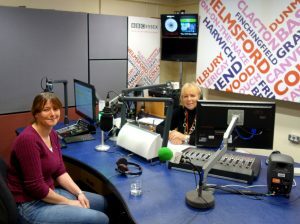 I was interviewed live on Sadie Nine’s BBC Essex show just after 7.30 this morning. Quite terrifying, but it did seem to go fairly smoothly. 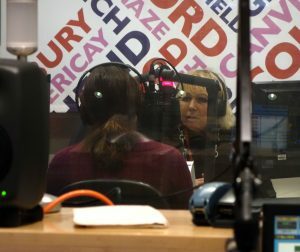 I was asked to go on to talk about dairy issues regarding a recent national drop in milk production as a result of a lot of farms going out of business. This has meant higher milk, cream and cheese prices and potentially a shortage of cream at Christmas. There’s been quite a lot about this in the newspapers. I also talked with Sadie about our micro dairy at the Farm and the milk and cheese developments. Out on the Farm, the cows came in a couple of weeks ago too as the temperature dropped. They won’t be out on the grass again until the spring and will enjoy being tucked up out of the rain. The rain has come just in time, we hope. The crops and grass have been so dry. They will have needed the couple of warm days this week to finish germination before winter sets in.